In Bujinkan Budo Taijutsu we train traditional Japanese martial art. The art consists of nine traditional fighting schools, which our Japanese Soke Masaaki Hatsumi combined into Bujinkan Budo Taijutsu, that comprises both unarmed and armed variety of techniques. Bujinkan Budo Taijutsu is not a sport, thus we have no competing! Our club works as a branch of Bujinkan Shinden Dojo, whose primary teacher (Dojo Cho) is Shihan Lauri Jokinen in Helsinki, Finland. 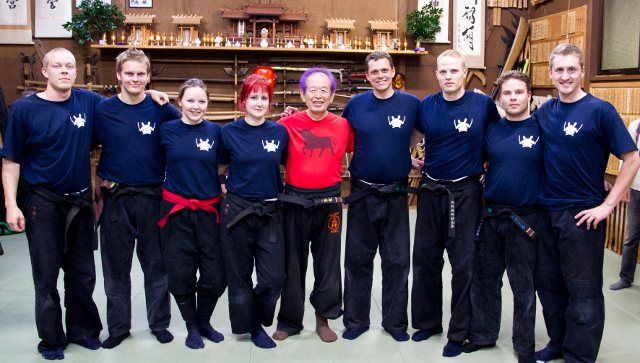 The responsible instructor in Oulu is Shidoshi Ismo Saanio. The teaching is primarily in Finnish, but there are people able to translate any needed information into English. You're welcome to participate in our training, but please do contact Ismo Saanio first for the time and place, because of possible cancellations or other changes in the training schedule.